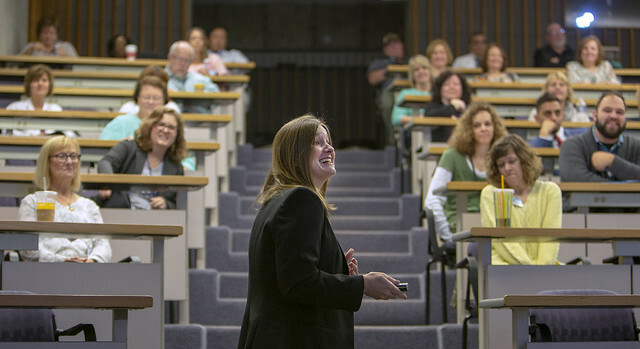 See more photos of Hershey Medical Center President Deborah Berini on Flickr. “There is so much to learn before I can work with our leaders to set a direction for the medical center,” said the St. Louis native who most recently served as chief operating officer at the University of Texas Medical Branch Health System. There, she led its growth from a single campus university-affiliated medical center to a regional health system. This marks her first time in the president’s chair. Berini said the collaborative environment at Penn State Health captivated her. “There are a lot of really talented people here doing amazing things in the service of our patients, and I was drawn to working with them,” she said. True to her leadership style, Berini said she didn’t come with an agenda—she wants to ask lots of questions and get feedback, so she can understand how she can add value. Berini devotes two hours each week to shadowing employees in the hospital to improve communication and advocate for staff and patients. The atmosphere and mission of an academic teaching hospital energizes the new president. “Our mission is patient care and to advance that care through research, education and community service—I love that,” Berini said. As the only university health center in central Pennsylvania, Hershey Medical Center is known as a critical regional resource and the only local medical facility that offers certain specialized and advanced care. Space is the biggest current challenge, with Hershey Medical Center routinely at 98 percent or higher occupancy. Construction will create new capacity to meet demand; however, additional strategies must be developed to ensure the Medical Center’s unique services are accessible to patients, she said. Meanwhile, the competitive health care environment in central Pennsylvania means superior patient experience is more important than ever, Berini said. Berini believes good communication starts at the top, which is why she devotes two hours a week to shadowing employees in the hospital. She is continuing the tradition of monthly employee breakfasts that Brechbill previously hosted and is working on developing a forum for frontline faculty. Back in the PICU, Berini stands at the foot of an elevated bed, cooing at 4-month-old Caden Hoover and telling his parents, Rachel and Zach Hoover, what a beautiful baby they have. The Hoovers have no idea they have just met the president of the medical center that is saving their son’s life. Caden was born with hypoplastic left heart syndrome and has had two of the three heart surgeries he will need. Those are words that Berini hopes to hear often during her tenure in the president’s office. Berini, rear, watches nurse Cara Kapaun, right foreground, help Zach Hoover, left, and his wife Rachel, care for their 4-month-old son Caden in the Pediatric Intensive Care Unit at Penn State Children’s Hospital. Entry filed under: Profiles. Tags: Deborah Berini, Milton S. Hershey Medical Center, president.